Truly wonderful, the mind of a college student is. Over the past few years, digital marketing has gained ground and more companies are opting for digital marketing techniques to reach out to students and nab them online. How exactly should you do this and what are the best methods to follow? Well, we’ll tell you. College is an important time in a student’s life. However, this post isn’t about college, but rather how to capture the attention of college students. They have busy schedules and have to balance studies, sleep, sports, a social life, and more. However, college students are also a great opportunity for you to improve your brand and even generate leads. Without further ado, DigitalBullLeads.com now brings you the top 20 ways of digitally marketing for college students. Assuming you’ve got a product or service that college students might like, how do you go about spreading the word? Well, you definitely shouldn’t steal it from someone else! Plagiarism was wrong in college and it’s still wrong now. Google says they prefer relevant content that is original and uncommon to increment its marketing. Students (along with most people) will hit the back browser if the information doesn’t matter to them. Also, be sure not to copy content from another website. This is a huge no-no if you want to rank organically. Choose your topics for online content wisely as well. If anyone has seen it before then it may make less sense for them to pay attention. Of course, there are some topics that are written to death like cricket, movies, music, etc. but you can try to apply your own spin on them. Remember that it must relate to your website, products, and services as well. The best way to reach college students is to keep it short and to the point. Most teens and young adults have a short attention span, so don’t bore them to death with a 10-minute video or a huge wall of text. Stay simple so that the idea behind it may be easily understood. Don’t use large words or phrases either, as this tends to confuse the reader (Eschew obfuscation, espouse elucidation). All age groups demand honesty and brands that are true to them about their product performance and features can have longer staying power. Keep it simple, stupid. A picture tells a thousand words, to use the oft-repeated statement. Pictures make posts memorable and can also help to draw in students. A picture can add a lot of flavor to your post and reduce the blandness. Be sure to add high-quality images to your blog posts and campaigns. An attractive image makes an average post good and a good post great. Be it blog posts or a social media post, use a picture to hammer your point home. You can try using memes as well, depending on whether or not they fit. To add on to the previous point, don’t rely only on text to get your point across. Video and audio help a lot. Students love watching these much more than reading a bunch of words, so AV content is much appreciated. Create a YouTube channel if necessary. If you have a demo video explaining how your product/service is used and showcasing it in action, that is much better than a write-up. Try doing a weekly or monthly podcast on a particular subject. Interactive media is more enjoyable and more likely to remember. In today’s technology-run world, most college students have yet to settle down to a routine. The best way to catch them up after college is through mobile marketing. Students are using mobile a lot more to browse the internet as they can do it on the go. College students live hectic lives. As such, make sure you optimize your website to be mobile-friendly. It is a strategy that may help you reach a large portion of college students on the move. Getting out of the virtual world and meeting with college students face to face is suggested. You learn about their likes or dislikes and gain valuable inputs on what’s missing in products already in the market. If you go to the campus and interview them, you can get them to use their contacts to gather information that may help target individual students or segments. Places, where students have their own community may prove to be helpful in influencing them. Facebook is the number one destination for college students and they spend hours on it. Social media promotion and marketing is a very effective way of targeting teens and young adults, which is the age range of college students. You can also look at posting content on Twitter and YouTube. College students in the US also tend to frequent sites like Reddit or Tumblr. Beware, though, for they can spot marketers from miles away! You should check out trending hashtags and topics and try to ride the wave. Note that LinkedIn probably isn’t a viable option as you are targeting college students here and not employees. Browse forums and blogs to get an idea of what students are looking for. Be sure to use your social media tools to respond to queries and talk to students and users, not purely for advertisement. A great way to engage is through competitions. Contests bring about people’s competitive spirit, and this is especially true for college students. Considering that they often think of winning or taking part in a contest as a fun, it may not take much effort to get them started. Offering them opportunities to win prizes will fascinate them. Quizzes, polls, giveaways, raffles, etc. all engage your college audience. Interesting contests are sure to grab their attention. It is a great way to promote your brand. You can create separate landing pages, social media accounts, and use mobile apps to segment your message. Furthermore, use A/B testing and proceed with the ad, look, or strategy that performs better. Never settle on one ad copy or page design. This ensures that you keep tweaking your messages and arrive at the best-fit to focus on the target customer. Too much tinkering is not good, but you do want to find out where you went wrong so you can fix it. College students may be a marketer’s dream, and they certainly get the word out very fast. However, the internet is a double-edged sword. Just like you can generate goodwill online, you can also court controversy. People are more likely to complain about a product on social media than they are to appreciate it. If this happens to you and someone takes to the internet to speak ill of you, do not panic. Keep calm. Some companies have the impression that accepting a mistake will lead to losing a lot of customers. However, it is better than doing nothing at all and ignoring the problem. Assuming the claim is legitimate, own up to your mistakes and issue a public apology. This doesn’t just apply for college students, but for any audience. Respond to the problem in a polite manner and remain calm. Avoid being hostile at all costs. Work to fix the problem and prevent it from happening in the future. Most people, college students included, check the reviews of a product before buying it. This is when Online Reputation Management becomes necessary. Even if you’re unable to remove a negative review, you could manage to quell the inferno that ensues when your reputation hits a downward curve. You need to convince college students to go out and buy the item. The ultimate goal of every business is to make money, but you need to talk about how your products or services benefit the students. Whether it is for entertainment, education, or a combination of both (edutainment), you have to state it. Why should they purchase this product? Give them a reason. Offering a coupon or promo code to test out your product or service (beta testing) works more often than not! If you have a website, showcase the promotion on it. You can even run a campaign about these offers as Facebook ads or Google Ads to entice students. Once you have your incentive(s) figured out, you must answer this question: Why should they purchase from you rather than a competitor? Find out what your USP is and use it to your advantage. It could be premium quality material or customer friendly service. Alternatively, you could also exploit what you perceive as your competitor’s weakness. For example, you could sell your product for a cheaper amount if you feel theirs is too costly. More on this later. Some buzzwords that college students like to hear are ‘canceled’, ‘no test today’, and ‘postponed’, and rightfully so! Do you want to know the most attractive word of them all? ‘Free’. This word creates excitement in them whether it’s a free product or service or anything where someone can get a discount or save some money. If ‘free’ seems too spammy, try using ‘no cost’ or ‘no expense’. Throw in freebies as it creates that initial buzz that may be required to propel your product past that user acceptance barrier. This adds on to point 13. By offering something for free, you are giving an incentive to them. One word of caution, though. Make sure that ‘free’ in your product messaging is not synonymous with ‘cheap’. You want to create content that is interesting, and humor is a great way to do that. Funny posts stick on for a long time either on your website, social media posts, or app. Of course, not everyone finds the same things hilarious and people have varying senses of humor, but it is a great way to connect with college students. You can add in pop culture references or current affairs if you feel like it. Cartoons, memes, or short video snippets can make your product or service go viral especially if it latches onto the current trends. For example, Wendy’s social media team on Twitter is known for its humorous comments. You don’t need to be as savage, but it is definitely a way to grab attention. Never underestimate the power of word of mouth. Students are always looking for new topics of conversation and your new product or service could be it. They tend to talk more about what’s going on currently, be it sports, movies, TV shows, or events. However, try to stay away from politics and religion as these topics cause division more often than not. Holding activities and putting your brand out there will lead to you getting more attention and students will do your job for you. For example, you could hold a jewelry fair/exhibition at a college as a jeweler. A clinic could offer free vaccine shots or hold a blood drive. You could also look at sponsoring college events either online or directly. A personal touch is important in your digital marketing activities. Some companies fear to take this route as they want to remain professional. The personal and business realms are slowly blending, however, so it is in your best interests. Plus, you’re marketing to students who themselves prefer personal communication. Use their actual name in emails or messages and reach out to them personally. This will make them feel comfortable with you and they feel that they aren’t just another customer. Try Instagram out as well. Just be careful not to post about your business all the time. Don’t tread on the students and never let your digital marketing efforts clash with the students’ good times. This includes constantly messaging them on Facebook or harassing them on Twitter. Be especially cautious not to call them when they’re in class, or they might get their phone taken away as punishment. If it happens frequently, then the students get restive and feel disinterested towards the product or service. After this, it becomes an impossible task to get their attention back. Keep your distance and don’t go out of your way to get in contact with them or message them. This is one of the areas where search ads shine because the person is looking for your services as opposed to browsing a social network. Don’t bug students. Pestering a college student is one of the worst things you can do as a marketer. This is huge as college students may not be able or allowed to freely spend their money. (I mean have you seen those tuition fees?) Anyway, when marketing items to students, you need to offer discounts (point 13) or assure them of value for money. If the students perceive your offer as too expensive or not enough value for the amount paid, they just may not be able to afford it. Try targeting the parents along with the students so both parties are on your side. As long as your product or service provides a tangible benefit to the student, the parents might be willing to make the deal. If you can deliver a high-quality product at an affordable price, you will be seen as a God in the eyes of college students. Those were the twenty tips you should follow when marketing for college students. They have a short attention span, but they can definitely make time for you if you’re worth it. DigitalBullLeads.com is a digital marketing firm powering lead generation for businesses. We use our DigitalBull GO platform as a Google My Business and website management platform for small businesses in the US. 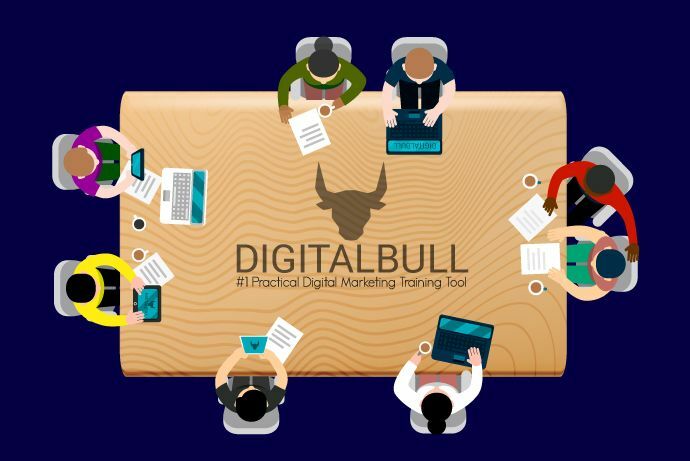 We also use it as a digital marketing training platform for college students through DigitalBull University. Need help getting the attention of college kids? you’ve come to the right place. Schedule a free consultation with us for extra details. Connect with us and let the Bull run wild!